Characters: 5 Parker is amazing. Her voice shines through so clearly. She's snarky, honest, and hilarious, and I love her for it. Her friends Molly and Sarah are great too. The minor characters throughout are extremely well developed without bogging down the story. I do have another favorite character, but revealing that would give alway some of the book. But if you're read this one before, I bet you've guessed who. Plot: 5 It's hard to say too much about the plot, except just how completely impressed I am with it, without spoiling some epic twists and turns. This is a great, inspiring story about how maybe, sometimes, everyone deserves a chance to be looked at again without judgement. 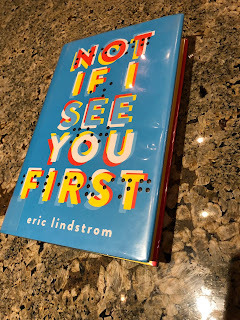 Writing: 5 Eric Lindstrom blew me away with his book from this year, A Tragic Kind of Wonderful, but, with Parker's story, I have reached a new level of impressed. I'd never read a book with a blind main character before, but Lindstrom really highlights Parker's other senses which allows him to build a rich and vivid world and give the readers a book that completely defies all expectation. I absolutely love how he let Parker be just Parker. The writing was barely noticeable because I was too busy hanging off the edge of my seat, laughing, or crying inside for Parker as she experienced her roller coaster.